It seems like everyday we hear about a new type of crime or scam that is taking over. Property Scams are real and can be really complicated. The first step in not being taken is keep your defenses up, especially if you are working with someone online. If you have never met the person or a licensed representative in person this can be a big red flag. 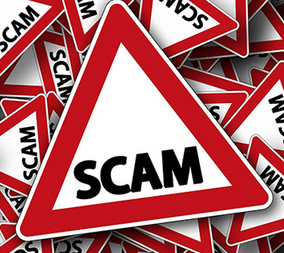 Following are some examples of real estate scams to be aware of. If you are selling a home and are contacted by someone long distance via email or telephone asking for information about you beware. Do not provide any sensitive personal information to a buyer of a home, they do not need it to purchase the property. An example of an odd request would be for them to ask for a copy of your purchase contract. That is when you purchased the home. Do not send copies of your previous purchase agreements or closing paperwork to an individual as the paperwork may contain personal information. They scammer will then try to use this information to steal your identity or clean out your bank accounts. I have been the victim of this scam…well sort of. I did not lose any money but may have lost out on some potentially great tenants. I rent out several properties and advertise them online. Last year one of my properties was picked up by someone out of the country. They then re-ran ads similar to mine with their contact information on http://www.craigslist.com and http://www.backpage.com/. So the scam goes something like this; a tenant finds a great deal on a property but the scammer pretends to live out of the state or out of the country and asks you to wire them the deposit in exchange for them mailing you the key. This is not normal. You should never wire money to someone that you do not know. You should also view a property and meet the owner or property manager / licensed realtor at the property to show it and coordinate the lease for you. I may catch some grief in the Real Estate community for even referring to this as a Scam, but the truth is many of the Real Estate Education programs out there are setup to charge you money whether you succeed or not. The typical Scam goes like this. You hear an Ad for a Free Weekend long workshop in your area. You think well I have nothing to lose attending a free workshop, so you go and check it out. Often the workshop is interesting and filled with high energy sales presentations designed to get you excited about their next coaching program. Then at the end of the workshop they offer a deal that is too good to be true for only a few hundred or thousand dollars you can attend the exclusive week long training for “serious” investors. That is step one, now they know you have a credit card that works. So, you attend the next workshop and they upsell you again on personal coaching or the next workshop because that is where all the real secrets are. Then you are out several thousand dollars and have made no dollars in real estate investing. Some are even worse and offer to find you the great deals since that is the hard part, they then sell you a property that they make money on and may or may not fit your needs. My personal mantra or opinion has always been “Buy Houses, Not Courses”. The organizer of a local REIA liked it so much he bought the domain and has their coaching program under that name. I’m not a huge advocate of mass produced courses like this but if you are interested in learning to invest I would suggest you find a good mentor or coach to shadow. Remember many of the people behind these scams are well practiced and can be extremely persuasive. You don’t have to be a victim just because you don’t want to be rude. Never let anyone pressure you into signing anything. It is okay to Trust people but make sure to verify their credentials especially if you met them through the internet. Use it to confirm information about the true owner a property or landlord. Following are a few things that should put you on alert that you may be involved with a scammer. The owner or manager is unable to meet you in person. They request money early on, before it makes sense or anything is in writing. They are asking you to wire them money. If you believe you have been scammed, you should report the incident to the FTC. If you sent money via Western Union or MoneyGram, report the incident immediately as you may be able to recover your funds if they haven’t been collected.